Western Australia’s only round of the Virgin Australia Supercars Championship! Buckle up for a massive night of Supercars racing action with a brand-new night racing format at the Perth SuperNight, 2 – 4 May 2019. Enjoy an exceptional viewing experience with undercover seating and great positioning for big screen viewing, food & drink outlets and amenities. PLUS, every Grandstand ticket holder gets a FREE Pit Lane Walk saving $30 and allowing you to witness up close teams and drivers in preparation for the 2019 PIRTEK Perth SuperNight racing. Detailed seating map available here. Buy early and save. Tickets will be more expensive at the gate. Bring your own chair, blanket or just yourself and enjoy all the night racing action! A Trackside ticket gives you the freedom to wander around and find your favourite spot on the track to soak up the atmosphere. Round up the family for a fun night out! Saturday only, this package entitles you to two Adult Trackside tickets and then FREE entry for multiple kids 12 and under. Plus, you receive a celebratory glow in the dark item for the family. Hurry, the glow in the dark item is only available to the first 1000 Super Saturday Family packages sold. Get your mates together and enjoy a super night out! Saturday only, this package entitles you to four adult Trackside tickets with bonus FREE Paddock access where all the behind the scenes action takes place. Save $120 and get closer to the teams and drivers working in the garages, the amazing purpose-built team transporters and maybe even grab an autograph from your favourite driver. The Paddock is where all the behind the scenes action takes place. You can get closer to the teams working in the garages, the amazing purpose-built team transporters and maybe even grab an autograph from your favourite driver. The official Supercars driver autograph sessions are held in the Paddock – so grab a Paddock Pass and you won’t miss out. A Paddock Pass does not get you into the event, only the Paddock area. Get closer to the action than you ever have before – in Pit Lane! Take a behind-the-scenes look through the epicenter of all the action in pit lane at the PIRTEK Perth SuperNight. Witness teams and drivers in preparation for the new night racing format. Pit Lane Walk sessions are available on Friday and Saturday – get in quick as tickets are limited. Please arrive 10mins prior to the start of your session. Late-comers will not be permitted onto Pit Lane and will not be entitled to a refund or exchange of session. Pit Lane walks are approximately 10mins. Please ensure you have your Pit Lane walk ticket ready to present to staff. Session times may be delayed or cancelled due to on track incidents. Pit Lane walk tickets must be used in conjunction with a valid event ticket. Session times may change at any time at the discretion of Supercars. It is advised that you check your session time on www.supercars.com on the morning of your allocated session time. Kids 12 years and under receive free trackside admission with a paying adult. With plenty of action on track there is something for all kids big and small. Ticket prices above do not include the Ticketek fees. A service & handling fee includes a one-off fee of $7.95 per transaction on all purchases. Ticket orders purchased by credit/debit card are subject to credit/debit card approval and customer account verification. All ticket/item prices include GST, if applicable, and are quoted in AU$. Concession includes: Full Time Australian Students, Pension card holders, Senior card holders and Disability card holders. Supercars has authorised Ticketek and Virgin Holidays to be our official ticketing and travel partners. Supercars will not be responsible for any tickets purchased through any unauthorised secondary seller or on-seller. The Paddock closes 30 minutes prior the end of the last Supercars race on each day. Anyone aged 16 years and under in the Paddock must be accompanied by an adult. The Paddock will generally be open all day, however note that due to safety concerns, the Paddock can be closed at any time. 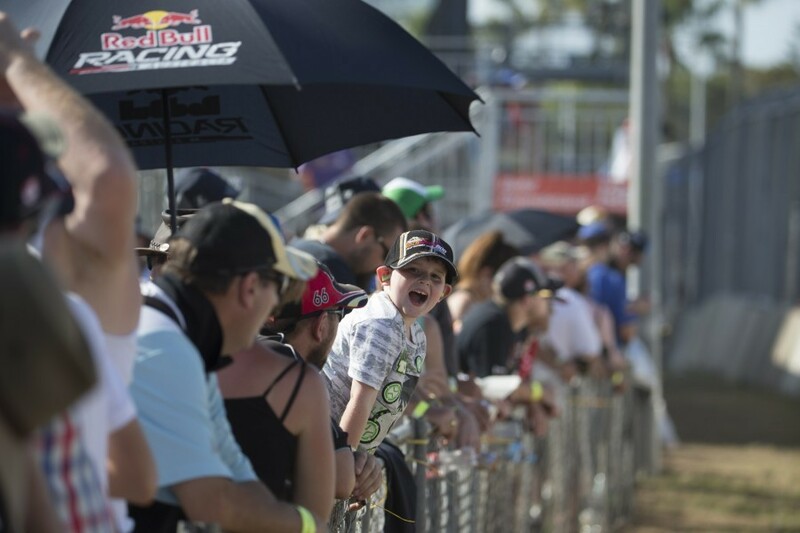 Kids 12 and under are permitted free access to both the Event and Paddock when accompanied by a paying adult. Kids 12 and under are not permitted into the Grandstand or Corporate areas without a valid Grandstand or Corporate ticket. Kids 3 and under can sit on their parents lap for free in the Grandstand. Kids 4 and over require a Grandstand ticket to access the Grandstand.